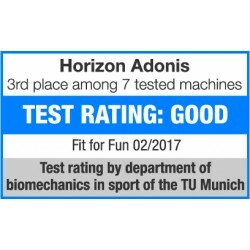 The Horizon weight bench Adonis is an excellent starter training bench. The weight bench Horizon Adonis has a 7 times adjustable backrest and a twice adjustable seat. 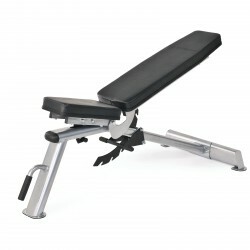 The Horizon weight bench Adonis offers many training positions: from negative to flat bench up to 90° angle. The separately available barbell rack of the Horizon Adonis collection makes the workout even more varied. The training bench has a very wide foot with nonslip, rubberized pads for safe strength training at home. The steel tube frame of the Horizon weight bench Adonis measures 100 x 50 mm and the training bench can be loaded up to 280 kg. A handle and transport wheels on the foot make moving the Horizon Adonis weight bench easy. Horizon Protective Mat size B In stock! Horizon Adonis Rack barbell rack In stock!